For a couple of years now the Rochester Falconcam has had a presence on the Facebook social networking site, including a personal page for “Jess” and a Rochester Falconcam group. We used those pages to keep Facebook readers up to date on our activities. Now we’ve taken our Facebook presence to a new level with the opening of the Rfalconcam page on Facebook. The page allows us to have a single place to post news and other information about both the falcons and the falconcam program. It also raises our profile as a non-profit organization. That can be helpful for seeking grants and other kinds of funding. You can help us gain exposure on Facebook. If you’re a Facebook user, click the link above to go to the Rfalconcam page, then click the “Like” button at the top of the screen to become a fan. The more fans we get, the better, so be sure to tell all your Facebook friends about us too! …I am aware of a few staff who are avid wildlife photographers. I will be sure to let them know about Quest and see if we can get some pictures of her. 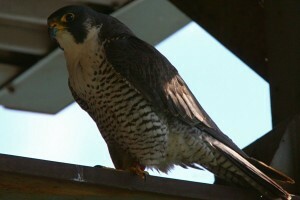 Canadian Peregrine Foundation. We hope that with their assistance wecan be sure that Quest chooses an appropriate nesting site if she decides to remain in Pickering. I’ll be watching for Quest at the station and tracking her on the internet. I’ll be sure to pass along any photographs if I can get some. We’re grateful to learn that Margo and the rest of the staff at the Pickering Nuclear plant are on the case. Check back here at Imprints for any pictures or reports that we receive. Quest’s westward move proved to be short-lived. She has returned to Pickering, with the vast majority of her September data clustered in the area immediately around the Pickering Power Generating station. We assume her male friend is still accompanying her. Since Quest seems to be settling in, we’re hoping that someone at the plant or birders in the area will be able to get a look at where she might be nesting. If we have any readers in the Pickering/Ajax/Tornoto area, it looks like you’re almost guaranteed to be able to spot Quest near the power station these days. If you do, send us a note to let us know what she’s doing. Quest closed out August near the Pickering nuclear station, but the first few days of September find her back in Scarborough. We can’t say whether she’s in the company of her tiercel friend, but it would be interesting if she were. Unlike much of August when Quest’s transmitter showed her ranging in a diffuse area from Scarborough south to the lakeshore, she seems to have settled into a tight pattern of movement between Pickering and Scarborough. Perhaps she’s scouting possible nesting locations, or maybe she just finds successful hunting in these two places. If there are any birders in the Scarborough area, keep an eye out for Quest. We’d love to hear about it if you see her! Truth, the saying goes, is often stranger than fiction. Followers of the Rochester Falconcam’s various forums and our Falcon Watch blog will know that there have been occasional reports of a falcon at Kodak’s facility to the north of Kodak Office. We’ve had some thought that this mystery falcon may have been Mariah, since she was seen there last year in the months following her release. 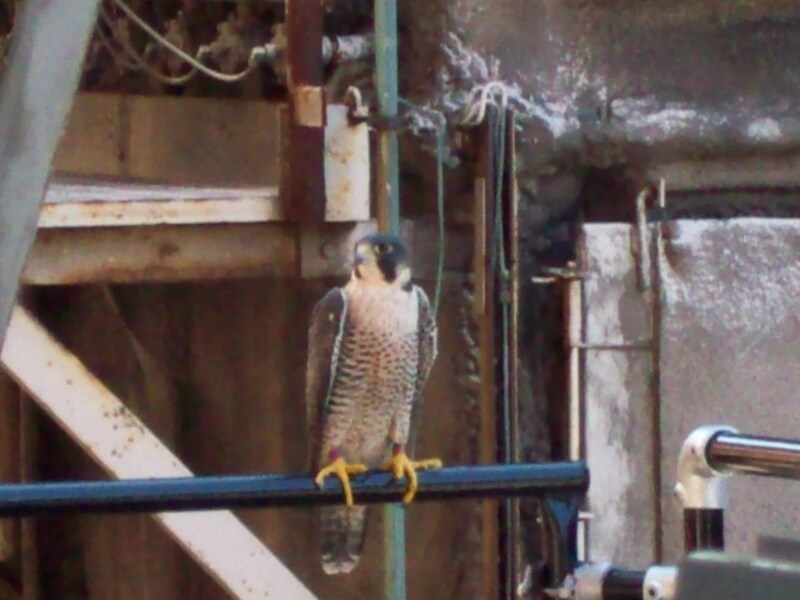 In the past few days we’ve been fortunate to get some photographs of an adult peregrine that has been seen at one of the buildings in Kodak’s Eastman Business Park (EBP). 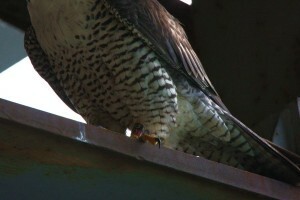 You can see that this falcon has a black and red ID band on one leg, and a purple band on the other. When Mariah was in rehab last year, she received a silver US Fish and Wildlife band that was covered with blue and yellow tape. So this bird clearly isn’t Mariah. But who is it? We’ve been busy putting the word out, and as it happens, purple US Fish and Wildlife bands are used out in the Midwest, as are black and red ID bands. 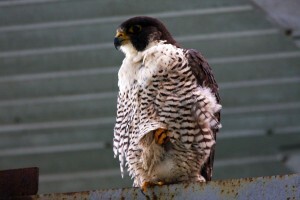 We contacted Barb Baldinger, one of the falcon watch volunteers in Macomb County, Michigan for more information. You may recall that Barb was the one who took the picture of Ihteram that we posted back in 2008. Barb wrote back, but since the ID numbers on the EBP falcon’s band aren’t visible in the picture, she couldn’t give us any help figuring out who this bird might be. We’ll keep trying to identify it, though. 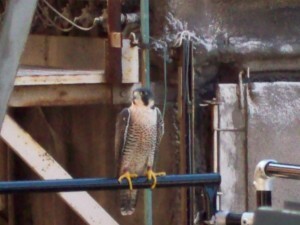 While she was responding to our inquiry about the mystery falcon at Kodak, Barb mentioned a new falcon that they discovered at the DTE Power Plant in St. Claire County, Michigan. 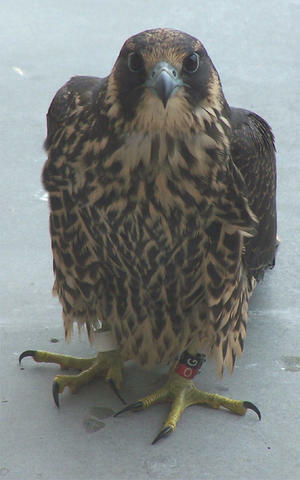 They’re trying to identify the falcon, and got a picture of its ID Band: Black/Red *G/O, with a silver USFWS band. According to Barb, that band isn’t in the Midwest banding database, so she wondered if we might be able to help with an ID. Does that band ID sound familiar? We don’t blame you if it doesn’t, but it turns out that band was assigned to our very own Alkyonis, one of Mariah and Kaver’s offspring from 2004! She had to be rescued twice, and spent a few weeks in rehab before finally returning to her family in August of that year. Falconcam team member Jim Pisello participated in one of her rescues, but with two rescues and a rehab under her belt, her future seemed uncertain. So it’s fantastic to learn that she beat the odds and has survived for over five years. Barb has promised us an updated picture of Alkyonis, which we’ll publish as soon as we get it. She did send us a shot that shows the ID band on her leg, so we’ll leave you with that for now. Update! We’ve received a couple more pictures of Alkyonis, courtesy of Barb Baldinger and Dan Miller. As you’ll see, she’s grown into quite a beautiful falcon! You are currently browsing the Imprints blog archives for September, 2010.